Over the semester break, from Dec. 16 through Jan. 10, new flooring will be installed in the ZSR library. During the time the library is open, there will be construction noise and dust. 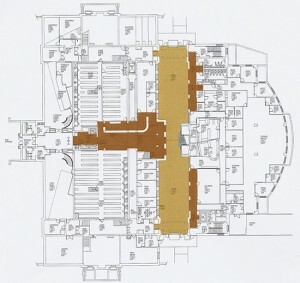 In addition to new flooring, the number of electrical outlets in the atrium floor will be increased to 80. The floor plan shows the areas of the main level that will be impacted by the project. All of the existing carpet and tile will be removed. The darker color shows the areas where resilient flooring will be installed. In the atrium, cork flooring will be installed. Read more about the flooring renovation in the Library Gazette. Library hours in December are available here. The library will be closed on Dec. 30 and 31. Follow @zsrlibrary and the Z. Smith Reynolds Library on Facebook.